Before Activator, there was no simple solution to streamline the content creation processes. Adapting content, managing digital assets, publishing to CRM and obtaining LMR approval often had to be performed in completely separate platforms – which requires additional training and involvement of multiple agencies and departments. Activator can perform all these actions in one system. In this way, the efficiencies produced by Activator help to reduce cost-per-slide and, by speeding up the content handling process, empower local countries to deliver the right content to HCPs in less time. Anthill Activator™ works directly with Veeva Vault to help people get more out of the content and assets they already have in place. No content ever leaves Vault, so every saved change, every imported image, and every update to interactivity made with Activator is stored directly in Vault. To help ensure content is always current and compliant, Activator allows users to quickly update their content to use the latest approved version of digital assets in Vault and notifies them when new versions of their assets become available. Anthill Agency has the highest level of Veeva Multichannel Content Partner Certification with more than 700 successful projects delivered for Veeva CLM, Approved Email, the Engage Product Family, and MyInsights. 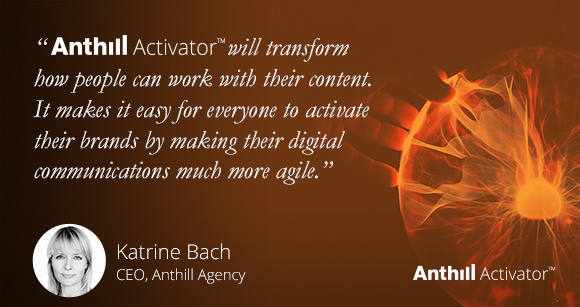 See Anthill Activator™ in action during our next webinar on September 27th. Anthill is a digital communication agency focused exclusively on the life sciences. The agency works with more than 35 life science brands, providing digital strategy and innovative content, specialist digital tools and training programmes, that enable companies to realise the full benefits of digital technology in all aspects of their marketing and sales communications.